I love reading books. They are a breather of fresh air and transfer us to a whole new and different world- enchanting, educating and relaxing us in return. Books have that charm and beauty that is difficult to ignore. After reading each book we become more knowledgeable, wise and increase our perspective of the world in general. I especially like to read short stories and novels. Detective fiction, thrillers, classics, and mystery related books are those that I scan during my visit to the bookstores and generally give the non -fiction sections a miss. This time however when I came across the self help book “Open Eyed Meditations”, I could not put it down. Just the title of the book was enough to captivate my attention. The book is written by Shubha Vilas who is the author of the bestselling “Ramayana- The Game of life series”. I have not read his earlier works but this book surely looked promising. I have heard about meditations but those that were done with the eyes closed. 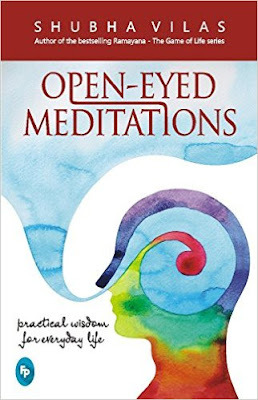 But this book "Open Eyed Meditations" was different. It gave a whole new perspective and dimension to meditations that which is done with the eyes open. Spanning across 280 pages, the book has 64 chapters (or meditations) and each chapter emphasizes some aspect or other of human behavior and how to handle different situations that we encounter in our day to day life. The author explains everyday problems and their solution in a simple and effective way taking examples of stories, characters and situations from the ancient scriptures like the Ramayana and Mahabharata. The book uncovers the hidden layer of wealth from these ancient books, links it with today's world and educates us with real life lessons which would help us to live a better life. As I went through reading various chapters of the book, I was enamored by the fluidity and writing style of the author. It is simple, easy to understand and easy to relate to. He flawlessly connects the stories of the past to answer the problems of the present. I never knew that I could read a non- fiction book in just a span of 3 days. The 64 chapters are gems rich in wisdom and knowledge. Every chapter has a brief summary at the end which I think is a great idea as after reading each chapter we get a clear and crisp summary which makes it more understandable, relateable and easy to follow in our day to day life. This book is a powerhouse of knowledge and surely deserves a place in every bookshelf. This is a book that has to be read again and again to sharpen and educate our mind into handling different situations that we might encounter in life. It gives a broader picture of life and advises us on how to behave with people, understand each other, relate to problems, handle tough situations and take correct decisions. I would definitely recommend this book to everyone as it has all the elements that which followed will help us lead a happy and meaningful life.